Deflation has cropped up at various times throughout the nineteenth and twentieth centuries. Overall since 1913 when the Bureau of Labor Statistics began tracking inflation we have had 22 years that had one or more months when the annual inflation rate was negative (i.e. deflation). Plus there were two brief two months periods, one in 1915 and one in 1936. But as you can see much of the “Roaring Twenties” was a period of Deflation. So Deflation and Depression are not synonymous. The cause of the deflation is the determining factor. If the deflation is caused by increased productivity without a corresponding increase in the money supply there will be a decrease in overall prices. At first this seems counter intuitive. With less money chasing more goods you would think prices would go up, but that is not the case. Think of the island example. If there are 10 items for sale and $10 in an island economy… the average price for each item will be $1. But if the supply of goods doubles but the money supply stays the same there will be 20 items but only $10 so the average price of each item will fall to 50¢. This is the good type of deflation. If however, capital is destroyed, lending is curtailed, people are afraid to buy, excess inventory is sitting on the shelves, then this is the bad kind of deflation. This is primarily the result of a snap back to reality after the government has inflated the money supply, over expansion has occurred and eventually reality must return. So we have a recession (or depression) to get the economy back on track. The following chart shows that deflation does not correspond with recessions. In the 1918 -1921 recession they started with very high inflation and only ended up with deflation as they were coming out of the recession, so deflation obviously wasn’t the cause of the recession and may actually have helped them come out of it. In 1913, the government instituted the income tax with the highest marginal tax rate at 7 percent. But in1916 it was increased to 77 percent to help finance World War I. The onerous taxation combined with all productive capacity going to the war effort resulted in a severe recession. After the recession ended in 1921 a prolonged recovery began which lasted throughout the 1920s. The Federal Reserve expanded credit, by setting below market interest rates and lowered reserve requirements encouraging big banks to go on a lending spree similar to the one we saw culminate in 2008. During the time following the recession the money supply actually increased by about 60% . The phrase “buying on margin” entered the American vocabulary at this time as more and more Americans over-extended themselves to take advantage of the soaring stock market and expanding credit. In 1925, governments around the world realized that they could not sustain a policy of easy credit so Britain returned to the “Gold Standard” which may have begun the contraction in the money supply and a return to reality which resulted in deflation. They were followed in 1928 by France. On February 2nd, 1929 the Federal Reserve announced a ban on bank loans for margin trades which slammed the brakes on the stock market and resulted in the crash in October. The 1929 – 1939 (Great Depression) was a result of the government continuing its tight money policies to wring the excess it had created in the early 1920s out of the economy. 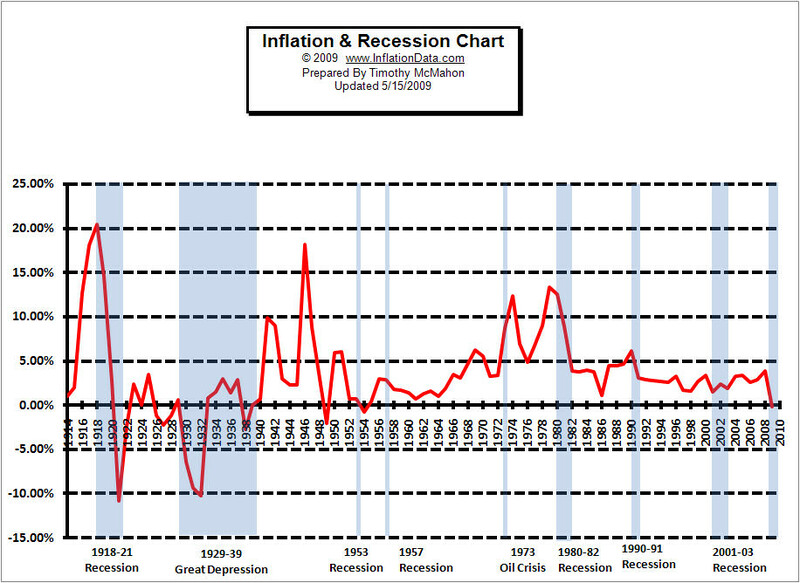 The 1953 recession comes smack dab between two smaller deflationary periods and so has no correlation to either one. The 1957 recession is during an inflationary period so once again there is no correlation to deflation. The 1971 recession was related to inflation and the Arab Oil embargo. Since 1955 we have not had a single deflationary year so none of the following recessions are related to deflation. So as we can see there is no correlation between deflation and depression except an unfortunate similarity in the sound of the words. Unfortunately, the “Great Depression” has inexorably linked them in the minds of Americans and also spawned the idea that wars can cure our economic ills. When in actuality, as we saw in 1918 and again in the 1970s wars probably cause economic suffering as much as they cause physical suffering. For more information on deflation download Prechter’s FREE 60-page Deflation Survival Guide. Can the Government Stop Another Great Depression?